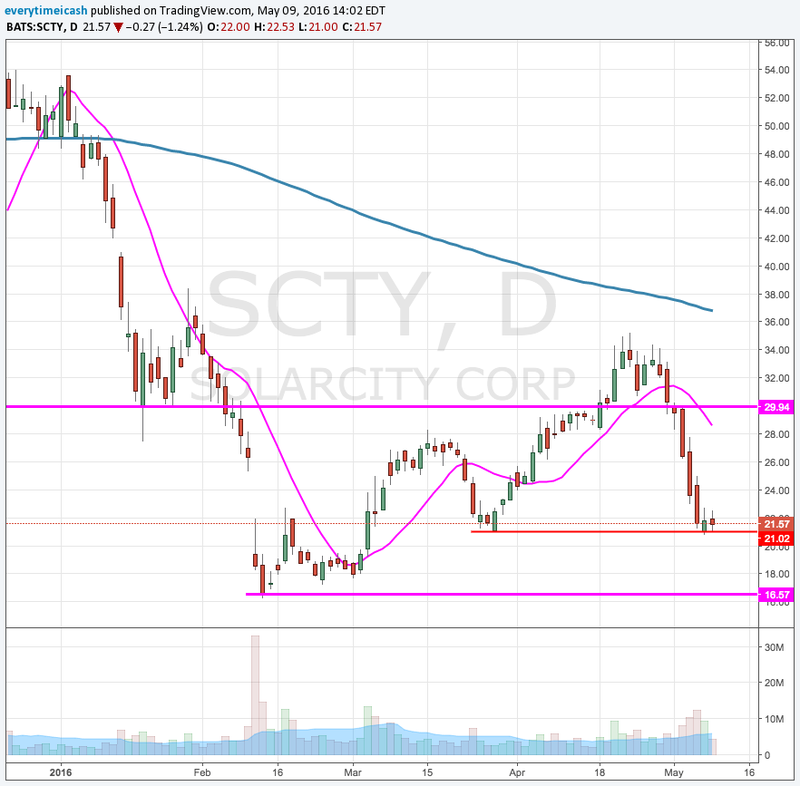 Solar City (SCTY) is set to report Q1 results tonight after the close with a conference call to follow at 5pm ET. Current Capital IQ consensus stands at a loss of ($2.37) on revenue of $110 mln. Investors are still nervous following the Q4 results which saw the stock sell off sharply after the co posted soft installations Q4 results and Q1 guidance. The company was unable to address the concerns around an increase in financing costs. They did announce two new refinancing deals this quarter which helped ease tensions. Investors would like to see an in-depth update on financing costs and an update on installations in order to be enticed back into the stock. MW Installed- SCTY guided for 180 MW which was below expectations and represented an 18% y/y decline and 34% q/q decline. Co reaffirmed its 2016 MW outlook for 1.25 GW. Q1 usually sees some seasonal weakness. Q4 came in at 272 MW (Guidance was 280-300 MW), +54% y/y. Co had 15 MW of projects pushed out of Q4 that were expected to be completed in Q1. MW Deployed- Q4 came in at 253 MW, +44% y/y. Cost per Watt- Q4 was $2.71, -5% y/y. Value of MW deployed- Q4 was $3.64 per watt. The primary focus of company in 2016 is goal of generating positive cash by year-end. Wants to achieve a state where it can self-sustainably install new MW without cash balance declining. For Q1 2016 SCTY expects to install 180 MW, representing growth of 18% y/y, and a 34% decline q/q. This represented a higher-than-usual seasonal slowdown that it has historically experienced. For Q1 2016, expect GAAP Operating Expenses of $230-240 mln. SCTY sees Non-GAAP Loss Per Share between ($2.55) -- ($2.65). Reports Q1 (Mar) loss of $2.56 per share, excluding non-recurring items, $0.19 worse than the Capital IQ Consensus of ($2.37); revenues rose 81.6% year/year to $122.57 mln vs the $110.02 mln Capital IQ Consensus. MW Deployed 214 MW, +40% y/y (Guidance was for 180 MW). "We significantly exceeded our projected 180 MW mostly due to the earlier completion of a large utility-scale project in Maryland that was originally anticipated for Q2 2016". Cost per Watt of $3.18 increased 19% from the fourth quarter of 2015 largely owing to lower volumes. Installation costs decreased 6% year-over-year, albeit rising 3% quarter-over-quarter to $1.98 due strictly to a larger mix of higher cost commercial projects. structured financed team recorded one of its strongest quarters yet with $728 million in total project financing raised in the quarter (and $1.1 billion through April). Portfolio is 74% residential and 26% C&I and is geographically diversified across 18 states plus D.C. (38% East Coast, 34% California, 13% Arizona, 8% Nevada, and 7% other). 'As this was not only our first transaction but also covered a portfolio that had a higher mix of C&I projects with 10- 15 year contract lengths than we typically install, we view this weighted average cost of capital as a starting point that will trend lower on subsequent transactions and ultimately expect this to be an important new channel for financing our growth in the future'. Co issues downside guidance for Q2, sees EPS of ($2.80)-($2.70), excluding non-recurring items, vs. ($2.23) Capital IQ Consensus Estimate; sees Q2 revs of $135-143 mln vs. $152.39 mln Capital IQ Consensus Estimate. Revenue from Operating Lease Prepayments and Upfront Incentives of $16-19 million. Co sees 185 MW deployed, down 2% y/y. Remain on target for our cost goal of $2.25 per Watt in 2017. Well positioned to achieve goal of generating positive cash by year-end even as we continue to add MW to our portfolio and incur cash expenditures for both research and development activities and our module manufacturing operations.